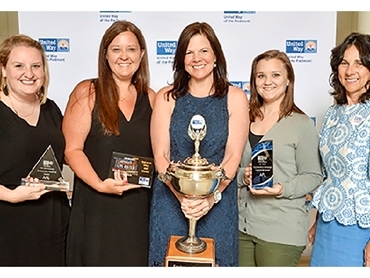 Leading global fibre optic cable, accessories and equipment manufacturer, AFL Telecommunications was honoured with four awards for their annual corporate campaign by the United Way of the Piedmont. AFL won the top award for Employee Giving (for companies at $200K+), setting a record by giving back more than $287,000 to upstate communities. The number of associates who donated increased by nine percent while associate donations grew by 11 percent. AFL also received the United Way Campaign Creativity Award. Based on United Way’s theme of ‘Lights. Camera. Take Action.’, AFL’s campaign disseminated information to their associates about Project Hope Foundation, an organisation that supports autistic children, and the impact United Way has on their ability to serve the community. Associates were also educated about United Way’s Young Professionals and Women United programs. AFL was also recognised for Outstanding Campaign Coordinator and Campaign Committee. All AFL US locations, including South Carolina, North Carolina, New Hampshire, Massachusetts and Washington, supported local United Way organisations, generating a total amount of $325,000. Locations internationally also supported the annual campaign, donating to various local organisations chosen by associates, and increased the financial impact to $352,000+ worldwide. AFL has an extensive Community Outreach Program that provides grants, sponsorships, associate engagement projects, disaster relief and more. For additional information on AFL and its community initiatives, visit www.AFLglobal.com.